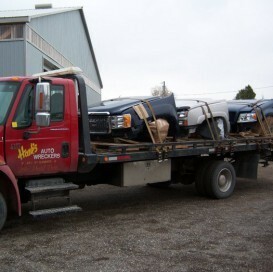 Hank's Auto Wreckers has been in operation since 1965. We have expanded from a one man operation to a 28 person third generation family run business to become Kitchener/Waterloo and surrounding areas source for used auto parts. We strive for the highest quality for our parts and the best in customer satisfaction. With our 28 staff members including 4 sales associates, 6 indoor vehicle dismantlers, 6 yard dismantlers. Our fleet of 8 delivery vehicles allows us to service much of Southwestern Ontario including the markets of Cambridge, Guelph, Stratford, Listowel, and Elmira, all the way North to Owen Sound and West to the London and Goderich areas. Hank's Auto Wreckers makes every effort to ensure that our customers receive the correct part in a quality condition in a timely manner. Our 20 acre, 20,000 sq/ft facility which includes 4,800 sq/ft of indoor dismantling, currently holds over 1,000 vehicle hulks, with over 120,000 inventoried parts, all of which are cleaned and inspected before they are shipped. At Hank's Auto Wreckers, we specialize in recycling newer late model insurance salvage to supply the collision industry, so you can be sure our stock is full of low mileage engines, transmissions and suspensions or whatever your needs are. Our main product lines are domestic and Asian light trucks and passenger cars as well as lower end European models. If we do not have your part in our on site location, our experienced sales staff can source it from a number of our trading partners within our network. We are also a recycler of end-of-life vehicles. We operate in compliance with a voluntary third party National Code of Practice which consists of audits of our process to ensure that we are handling and dismantling our vehicles and their harmful fluids in an environmentally sensitive manner. Give us a call for your automotive needs whether you are selling your end-of-life vehicle for recycling or looking for quality used, rebuilt, new take off, OEM surplus or new aftermarket parts. Remember, our commitment to our customers extends beyond the sale, at Hank's Auto Wreckers; "You're not just buying a part, you're buying experience."